Dulux colour mixing Weathershield Smooth masonry paint is an exterior paint formulated with unique ICI acrylic resin to give 15 years guaranteed all-weather protection. Stir thoroughly before use with a palette knife or similar implement. Thinning is only necessary when sealing new for bare surfaces in which case add up to 1 part water to 5 parts Dulux colour mixing Weathershield Smooth masonry paint. 2 full coats of Dulux colour mixing Weathershield Smooth masonry paint are normally required. However, on previously painted surfaces in good condition, where similar colours are used, 1 coat may be sufficient. 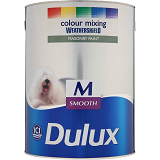 The coverage of Dulux colour mixing Weathershield Smooth masonry paint will vary according to the surface that is to be painted. An approximate guide is 5.5-7.5m2/litre on smooth surfaces such as rendering and 3-4m2/litre on rough surfaces e.g. pebble-dash. It is always a good idea to apply a small test area first.